This review of Toji: Pure Density is aiming to help customers make up their minds regarding which of the hair growth products are actually worth investing in. 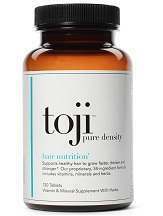 Toji consists of 34 ingredients that includes mineral and vitamins that help in the growth of longer and stronger hair. It is available on the product’s website as well as on other shopping websites. One needs to take this supplement for six months on a continuous basis and should take two tablets in the morning with food and water and two tablets in the night with food and water. There are two options that have been given to the customers. One is to buy a 30 day supply which is one bottle priced at $14.95 while the other option is to buy a 90 day supply that comes to $106.95. The main cause for hair loss lies in poor nutrition and once I started taking these supplements, they made up for the poor diet that I had. That is not to say that it should be taken in place of food but it makes up for the nutrients that are missing from one’s body and the results were good. My hair fall has reduced and I can feel my hair quality improving. I have been taking this supplement since a month and will continue to do so for the coming months. There are no known side effects that can be caused by this product but it contains soy and those who are allergic to it should avoid taking this supplement. However the makers of this product recommend that one consults a doctor before taking this supplement so as to avoid any future complications. The manufacturer is willing to give a full refund on the entire purchase as well as the shipping charges for up to three bottles. One should inform the manufacturers if they are not satisfied with the purchase within 60 days. The customer reviews both on the product’s website as well as on the shopping websites are good and positive and increase the feasibility of the product. Toji: Pure Density is made of natural ingredients and there is a page on the website where all the ingredients that are used are displayed with pictures and there are details written about every ingredient that has been used. The reviews are good and encouraging. The return policy makes it a viable option as well as the safety precautions that need to be taken has been listed down.